A sheriff comes to your business or home with a summons or you receive a subpoena by registered letter. It's always scary when something like that happens. So what do you do? First, we'll look at the differences between a summons and a subpoena and then what to do if you receive one. In general, a summons is the beginning of a legal case. It signals the issue that needs to be adjudicated (tried in court). A summons can be used in either a civil or a criminal case. Specifically, a summons is a document that is an order by a court requiring someone to appear in court. In civil lawsuits, a summons is issued to one of the parties in the lawsuit, usually the person against whom a complaint has been filed. Most often, a summons is given to a defendant, requiring his or her presence to defend a case. For example, if someone sues you in small claims court, the court sends out a summons requiring you to attend the hearing at a specific place and time. In general, a subpoena is a demand by the court to provide evidence for a court case. A subpoena is similar to a summons, but it comes after the court case has begun. To receive a subpoena you may or may not be directly involved in the case as a plaintiff (the person making the claim), or the defendant (the person defending against the claim). The most common example of when you might receive a subpoena is if you are a witness in a court case. In today's legal system, it's very common for plaintiffs and defendants to be required to give evidence under a subpoena. A subpoena can be for documents needed as evidence or it may be for appearance to give evidence in a deposition or in court. What's included in a Summons? How the person who receives the summons must respond. The party receiving the summons must sign to show that the summons has been received. For this reason, almost every summons is delivered in person, by an officer of the court which is hearing the case. 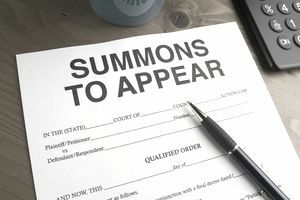 A summons or subpoena is an official court document. In fact, the term "subpoena" comes from the Latin for "under penalty." You must respond to a summons or a subpoena as required and by the deadline required. Not responding to a summons means that you may lose the case by default. For example, if you don't respond to a summons to small claims court as the defendant, the plaintiff gets the judgment (the court's decision). If you receive a summons, you will have a specific amount of time to reply to the summons. If you don’t reply, the other party may be given a default judgment, meaning that you have given up the right to contest the issue. In some cases, both company officers and the company itself may be served with a summons. If your business is a sole proprietorship, you will be served with a summons personally. If you receive a subpoena, you must submit the required information or appear when required. In most cases, you will have to give a deposition (similar to testifying in court). If you don't respond to a subpoena, you can be cited for contempt of court for your failure to appear. If you need to reply to a summons or subpoena, include all the information about the case, so you can be sure your reply is filed correctly. In either case, if you cannot do what's required or you cannot show up when required, you may be able to ask the court for a change, which may or may not be granted, depending on the circumstances. Do I need an attorney to help with a summons or subpoena? It depends upon the circumstances. If the summons is to small claims court, or if it's a very simple issue, you might not need an attorney. It's always a good idea to get help from an attorney if you have questions or need help in dealing with the issue.